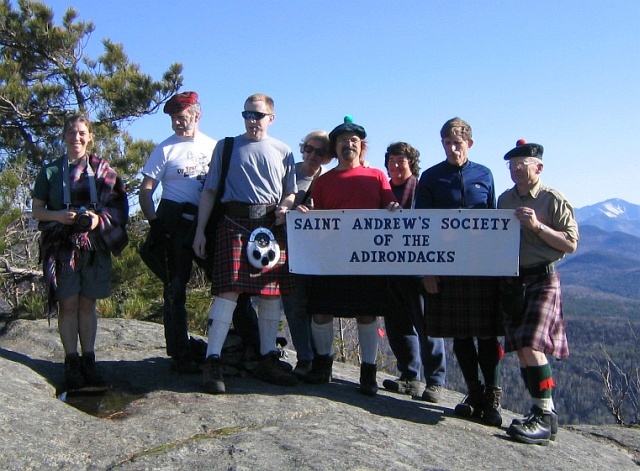 The St. Andrew's Society of the Adirondacks began its way to existence on September 8th, 2001 at the Whiteface Mountain Highland Games in Wilmington, New York. At the end of the two day event, there were forty paid members, who reached out to the calling of the Celtic ray, and made this Society happen. After only one year, the membership almost doubled! The current membership is based in New York, but members are located as far away as New Jersey, New Hampshire, Texas, Quebec and Alberta, Canada. The founders of the St. Andrew's Society of the Adirondacks made some ground breaking history when they elected a woman as president to open the Society. The St. Andrew's Society of the Adirondacks is open to anyone who has an interest in Scotland. The Society, named after Scotland's patron saint, was originally a vehicle for Scottish immigrants to help incoming immigrants who were in need. Today, we recognize that Scots are no longer in need, and so we carry on the history and perpetuation of Scotland. and $250.00 for lifetime membership per person. please click here (pdf format - Adobe Acrobat Reader). Several recent newsletters are available as pdf files (Adobe Acrobat Reader format). The St. Andrew's Society of the Adirondacks offers an annual Joseph McCallie Scholarship. Named for one of the founding members of the Society, the scholarship is awarded to support study of Scottish music, dance, and language, as well as writings in the areas of Scottish history, Scots in America, and Scottish culture. Zoey Flansburg of Schenectady, is a 13 year-old member of the Grade 4 Capital District Youth Pipe Band. She has been playing the bagpipes since she was nine and plans to use her scholarship to pay for lessons. Alec Flansburg of Schenectady, is a 10 year-old member of the Capital District Youth Pipe Band. He has been playing the drums for 5 years and plans to use his scholarship to pay for lessons. Hannah Bopp and her sister Erika Bopp of Albany are both Scottish dancers with the Braemar Highland Dancers. Hannah is 11 and has been dancing for 8 years. Erika is 14 and has been dancing for 9 years. They plan on attending the Braemar Summer School of Highland Dance and Kilt Making this summer at Emma Willard School. SASA will once again offer one or more scholarships in 2019 for study of piping, drumming, or Highland dancing, for pipe band and competition fees, or for research into Scottish history or culture. Applicants should live, work or attend school in the greater Adirondack region, and should send a letter of application to St. Andrew's Society of the Adirondacks, P. O. Box 1424, Lake Placid, NY 12946 by April 30, 2019 (extended from 3/31). Please let friends, family, and pipe band members know about this. 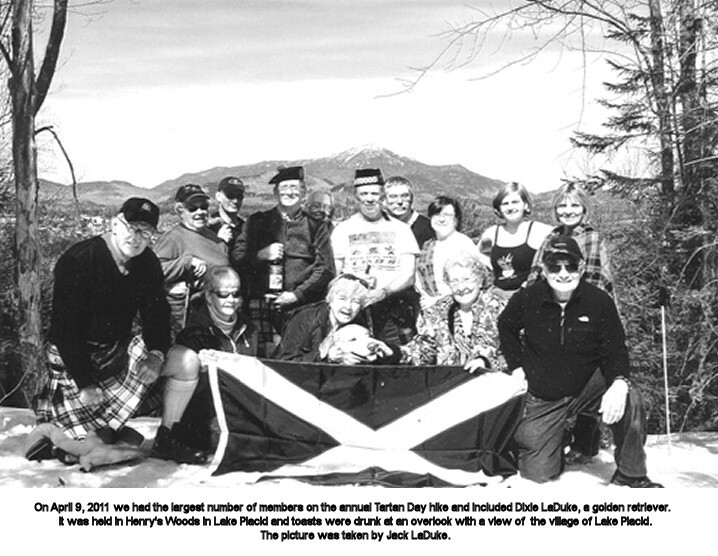 The St. Andrew's Society of the Adirondacks usually celebrates Tartan Day each April with a walk or hike in the Adirondacks region, such as Lake Placid or Lake George. Beginning in 2014 this has included a trip to New York City for the parade there. Will you be with us?